Aurora’s Farmers Market, located in historic Aurora, Illinois, is the state's oldest continuously operating Farmers Market, in operation since 1912. The market is governed by city ordinance and managed by the City of Aurora Special Events Department. We invite you to shop for fresh from the farm, locally grown fruits, vegetables and preserves, artisan cheeses, old world breads, smoked meats, sweets of all sorts and a very diverse selection of handcrafted products. Come taste the difference of just-picked produce and get to know your farmer and baker personally. In addition to all the great products we offer cooking demonstrations, healthy living initiatives, live music, children’s activities, special events and much more. At Aurora’s Farmers Market you’ll not only discover new treats and sample the freshest produce around but can connect with friends and neighbors in a relaxed and pleasant atmosphere. By shopping our hometown market you are supporting locally owned and operated small and micro businesses as well as fostering the economic development of the entire community. Our market acts as a small business generator, providing the outlet for many new micro businesses to sprout and test out the marketplace. Then hopefully one day grow bigger and open a brick and mortar location. Aurora’s Farmers Market is like what “Main Street” used to be decades ago, filled with small locally owned mom & pop businesses, where everyone knew the owners and the owners knew their patrons by name. Aurora’s Farmers Market is an integral part of the urban/farm link. It offers direct interaction between growers and citizens and facilitates the formation of personal relationships in a way that is not possible at most 21st century retail stores. Recent studies show that Farmers Market patrons have 10 times more conversation than those shopping at a grocery store. This important interaction strengthens our community’s social fabric by serving as a place for informal gathering. Community members cultivate new interactions not only between themselves, but with the farmers, artisans, and entrepreneurs in an environment focused on renewal and revival. The rich benefits of Aurora’s Farmers Markets has endured for more than 100 years and will continue for generations to come. 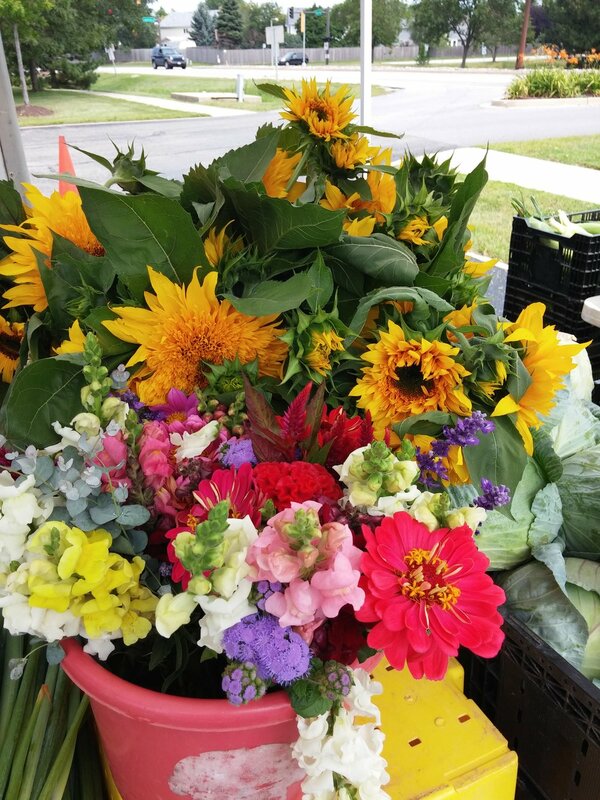 We invite you to shop for locally grown just-picked produce, fresh from the farm preserves, artisan cheeses, old world breads and a very diverse selection of handcrafted products at Illinois’ Oldest Farmers Market. Come taste the difference and get to know your farmer and producer personally. Discover new treats, sample delicious fresh produce, and connect with friends and neighbors. Aurora’s Farmers Market supports the viability of a local agricultural economy which fosters the stewardship of our land and goodwill in our community by: providing a place for farmers and artisans to sell their goods directly to consumers; educating consumers on the benefits of better nutrition; providing a place for community groups to present their programs to residents; creating a family friendly atmosphere amid a vibrant gathering place that builds community spirit; and promoting economic development by drawing people to the downtown business district. The rich benefits of Aurora’s Farmers Market have endured for more than a century and will continue for generations to come. Aurora’s Farmers Market opened for business at 5:00 AM on Tuesday, April 3, 1912 in downtown Aurora, Illinois along the banks of the beautiful Fox River. It was a cold, wet early spring day and the roads into town were muddy and unpaved, typical of the era. Despite the challenges, one lone farmer with a wagon full of items was able to make it to the new market at 10:00 AM. Despite being five hours late, he was rushed upon by patrons and sold out his wagon of eggs, apples, and chickens in 10 minutes. The success of that lone farmer, along with countless other producers, continued and more than one hundred years later Aurora’s Farmers Market still exists along the banks of the beautiful Fox River in historic downtown Aurora. Although the market has had several homes, one thing has remained constant; a love of shopping for the best produce, foods, and finds in an exciting community setting. Below are actual newspaper articles from that first market season in 1912. They have been rekeyed for ease of reading. If you have any bits of market history or old photographs, we would be pleased to add it to our archives. Send an email to farmersmarket@aurora-il.org to share.